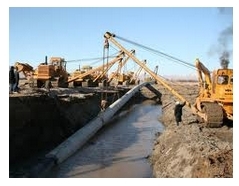 Iran-Pakistan-India Gas Pipeline or simply IPI Project is also called “Peace Project”. Many companies from different countries are interested in IPI Pipeline Project; Gazprom (Russia), BHP Billiton (Australia), PETRONAS (Malaysia), Total (France), Royal Dutch Shell, BG Group and GAIL India. Route for IPI Pipeline was proposed from South Pars Oil Field Iran to Khuzdar, Karachi, Multan and then to New Delhi. 7.5 Billion US Dollars total cost was estimated. And the project was to be started in 2009 and completed in 2013. 2775 km of 56 inches pipeline was to be laid down. But due to the influence of USA, India has detached itself from IPI Pipeline. Iran will supply 750 MMSCFD gas to Pakistan for 25 years. Project was to be started in September 2009 and target date for completion is June 2014. Route for Iran Pakistan Pipelines will be Iran-Gwadar-Bhong. Total length of the IP Pipeline is 2100 kilometers. Iran has completed its 1100 km pipeline and Pakistan has yet to start. Diameter of pipeline has been reduced to 42 inches. Pakistan has to spend an amount of approximately 3.5 Billion Dollars. Sui Northern Gas Pipeline Limited Pakistan, Sui Southern Gas Company Limited Pakistan, The National Iranian Gas Company Iran and Khatam ol Anbia Company Iran are responsible for the erection of pipeline. 250% increase in gas consumption in Pakistan is expected. Iran has to support its week economy and Pakistan is in need of natural gas. Lt. Colonel Malik Aftab Ahmed Khan, a Civil Engineer of Military College of Engineering, Risalpur conceived this idea in 1950. He named it “Persian Pipeline”. Ex. Foreign Minister of Iran Ali Shams Ardekani and Rajendra Pachauri DG of TATA Energy Research Institute discussed this concept. In 1993 an MOU was signed between India and Iran. But after the participation of Pakistan in 1994, the project became feasible. USA has sanctioned ban on Iran under Iran/Libya Sanction Act 1996. USA has been succeeded to detach India from IPI Pipeline. USA has proposed an alternative gas supply to South Asia from Central Asia; this project is called TAPI Turkmenistan-Afghanistan-Pakistan-India Pielines. Russian, Iran and Pakistan want multi-polarity system in the world. Europe depends on Russia for its 41% gas requirements. China is already considering an oil pipeline from Middle East to West China through a shortest route from Pakistan. China has played a key role in the development of Iranian South Pars Oil Field. If China becomes a partner of this pipeline project then financing will become a “Non Issue” for Pakistan and Pakistan will also earn revenue from the transit of gas through its territory. Iran has also offered to build an electricity transmission line from Iran to Pakistan, India and China. Iran has also interested to supply electricity to Bangladesh. Peaceful Baluchistan is too much necessary for the successful completion and coming into operation of this project. BLA (Baluchistan Liberation Army) and other militant groups can be dangerous for it. Trans-National Gas Pipeline will give strength to Pakistani Economy and Baluchistan Province will also be developed through this project. A Technical Institute and an Engineering University should be urgently built in Baluchistan and graduates from this institute and University should be employed in this project. And a comprehensive share from the income of this pipeline may also be used for the development of Baluchistan.